John C. Maxwell, the #1 New York Times bestselling author, coach, and speaker who has sold 25 million books, is called America's #1 leadership authority. In 2014, Maxwell received the Mother Teresa Prize for Global Peace and Leadership from the Luminary Leadership Network, and was named the world's most influential leadership expert by Inc. and Business Insider. For more information visit JohnMaxwell.com. NYT bestselling author explains to corporate culture fixated on talent: Talent is Never Enough. John Maxwell teaches us how to make and keep lasting professional realationships. 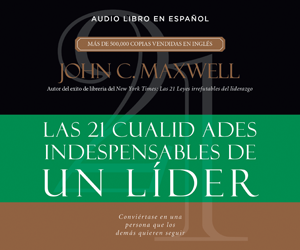 John C. Maxwell bottles up his thirty-plus years of leadership experience in this audiobook. Dr. Maxwell explains the true qualities of leadership and how they influence others around you. Now in one volume, John C. Maxwell’s best-selling 101 series of briefcase-sized leadership books. Start leading now 360° leadership skills. Smart leaders learn from their own mistakes. Smarter ones learn from others' mistakes-and successes. John Maxwell shows how to develop the vision, and motivation required of successful leaders. Learn how to be an effective leader from the master John C. Maxwell. Learn how to make failure your friend to ensure success. Attitude can make or break you and the people you lead. John Maxwell gives the bottom line on mentoring in one short, easy-to-read volume. A concise collection of time-tested principles on how to equip those around you for service. Learn how to lead by giving others the tools they need for success. You have the potential to become a success today.